The Chair of the Canadian Motorcycle Hall of Fame Board and all the Directors, are pleased to announce the sixth member of the Class of 2018. Al Dyck will be honoured at the 13th Annual Induction Banquet and Reunion which takes place November 17th at the Delta Hotels Burnaby Conference Centre in Burnaby. 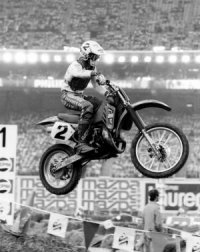 “ Too Trick” Al Dyck started riding dirt bikes in 1977, and in 1979 at the age of 15 he started his first year of racing. He followed in the footsteps of other great BC riders including Bill Mclean, Terry Hofoss, Larry Mckenzie and Bob Levy, to name a few. In that first year Al won the BC and Canadian National Championships in the 80cc class in Aldergrove, BC. Quickly, Al moved through the ranks and by the end of the second year of racing was in the Expert class. He won many provincial titles and in 1986, won all three BC and Manitoba Championships. He capped off the year by becoming one of the few Canadians to win the prestigious Montreal Supercross. Al competed in three Motocross Des Nations 1986, 88 and 89 where team Canada finished top 10 in two of those years. Al rode during the years of Ross Pederson’s dominance but in 1988, won the National Championship in the 125 class and also received the most points in all classes combined. Again, he won all 3 Provincial titles in BC and Manitoba. In 1988, Al won the CMA White Memorial Trophy (best performance by a Canadian Rider in all disciplines). His absolute best year came in 1989, when he pulled off the “Triple Crown” making him the only rider in Canadian history, besides Ross Pederson, to win the 125, 250 and 500cc National Championship titles in one year.